They save energy and reduce your electric bills: With a Tempra tankless system there are no standby losses that tank-type water heaters are subject to. This results in savings of at least 15-20% when compared to an electric tank water heater. They supply an unlimited quantity of hot water: With a Tempra heater, water is heated only as it is used, and for as long as it is needed. Therefore, there is an endless supply of hot water. and no one runs out of hot water in the shower, even if the shower runs for a long time. They have a sleek design that saves space: The Tempra heater completely replaces a conventional tank heater, yet takes up considerably less space, saving valuable living space and providing endless hot water on demand. They are easy to install: Large and bulky hot water tanks are usually placed in a basement or utility room. Because the tank may not be close to where hot water is used, there is a waiting time for hot water. 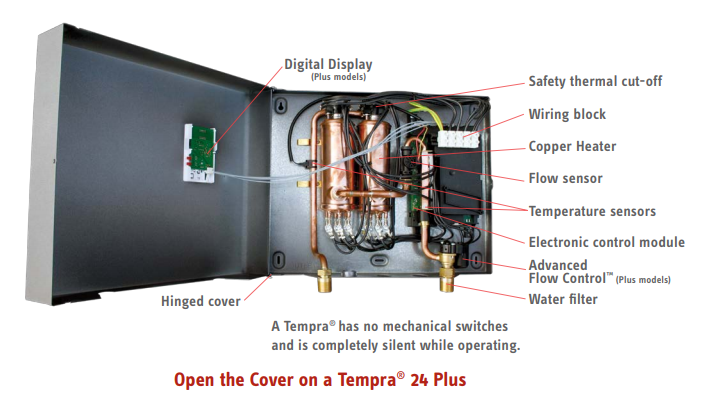 The Tempra’s compact design can be installed close to the hot water taps. When this can be done, in new construction for instance, the waiting time for hot water becomes as short as possible. Even in a retrofit, where it might not be possible to place a Tempra closer to the hot water draw-off points, its considerably smaller size has many advantages. They don't require any venting: Tempra tankless water heaters are electric and require no venting. This allows for more flexibility when determining the best place for installation. They feature a seismic proof construction: Because a Tempra is a tankless water heating system, it is not subject to seismic building code. There is no need for the preventative construction required with a tank water heater. The maximum output temperature can be limited: Tempra Plus tankless water heaters can be set to limit the maximum hot water temperature to 109°F. This can be important in some installations to prevent the possibility of scalding.. They can keep constant output water temperature: Smart microprocessor technology in a Tempra allows setting the knob on the front cover to the water temperature needed and getting that temperature every time a hot water tap is opened. The Stiebel Eltron exclusive Electronic Temperature Control ensures a steady output temperature even if flow rates vary up or down. Tankless electric water heaters from other manufacturers may not maintain a steady temperature if the incoming flow varies. A Tempra always does. While Tempra Plus models have the convenience of a digital display, both models make it easy to get hot water at the desired temperature from hand washing temperatures of 86°F (30°C) to shower temperatures of 107°F (42°C), up to 140°F (60°C) for commercial applications. They feature self-modulating energy technology: Energy output is continually and automatically adjusted to ensure that only the smallest amount of electricity necessary is used to heat the water. Stiebel Eltron Tempra 15​ is the 15-kW tankless water heater made by the company with a maximum heated water flow capacity rate that can be as high as 3.1 GPM in warm climates,which can provide enough hot water simultaneously for one shower and three bathroom sink faucets, or for two showers. Tempra 15 measures 17 x 17 x 3.75​ (inches) and weighs 16.1 lbs. Stiebel Eltron Tempra 20​ is the 20-kW tankless water heater made by the company with a maximum heated water flow capacity rate that can be as high as 4.0 GPM in warm climates, which can provide enough hot water simultaneously for two showers and two bathroom sink faucets. ​Tempra 20 measures 17 x 17 x 3.75​ (inches) and weighs 16.1 lbs. Stiebel Eltron Tempra 24 is the 24-kW tankless water heater made by the company with a maximum heated water flow capacity rate that can be as high as 5.0 GPM in warm climates, which can provide enough hot water simultaneously for two showers and four bathroom sink faucets. Tempra 24 measures 17 x 14 x 3.75​ (inches) and weighs 16.1 lbs. Stiebel Eltron Tempra 29 is the 29-kW tankless water heater made by the company with a maximum heated water flow capacity rate that can be as high as 6.0 GPM in warm climates, which can provide enough hot water simultaneously for three showers and three bathroom sink faucets. Tempra 29 measures 11.5 x 8 x 3.75 (inches) and weighs 19 lbs. ​Stiebel Eltron Tempra 36 is the 36-kW tankless water heater made by the company with a maximum heated water flow capacity rate that can be as high as 7.5 GPM in warm climates, which can provide enough hot water simultaneously for four showers and three bathroom sink faucets, or three showers and five bathroom sink faucets. Tempra 36 measures 11.5 x 8 x 3.75 (inches) and weighs 19 lbs. ​They feature the exclusive Stiebel Eltron Advanced Flow Control technology: If the demand asked of a Tempra Plus is greater than the unit can handle, Advanced Flow Control works by slightly reducing the flow of water. Instead of delivering colder water than the set point, a Tempra Plus automatically delivers slightly less water, but at the correct temperature. They feature the convenience of a digital display. The water flow rate that can be obtained with each of these heaters depends on the incoming water temperature. Below is a chart showing the maximum flow rate capacity of each model, measured in gallons per minute (GPM), for various inlet water temperatures (from 42°F to 72°F). Note that a single bathroom sink faucet may require a water flow rate of about 0.5 GPM, a single shower when fully opened may require a water flow rate of about 1.5 GPM, and a single kitchen sink faucet may require 1.5 GPM. Also, as the temperature of the inlet water rises, the water flow rate capacity of the heater rises as well, which means that you need to select your heater model based on the lower winter temperatures in your region. If the heater can provide enough water flow for your home's needs in the winter, it will provide even more in the summer. So, based on the number of faucets and showers you have at your home and the expected winter water inlet temperature where you live, you can use the following chart to determine the flow rate you will obtain with each heater model and select the model most suitable for your home. Note: The temperatures shown in the chart are for USA regions only. If you live outside the USA, you should first determine the average low temperature of where you live, and then use the chart to select the heater model that will respond best to your home's needs. ​For example, if you have 2 bathroom sink faucets and a single shower, you will need a total water flow rate of (2x 0.5) + (1.5) = 2.5 GPM. 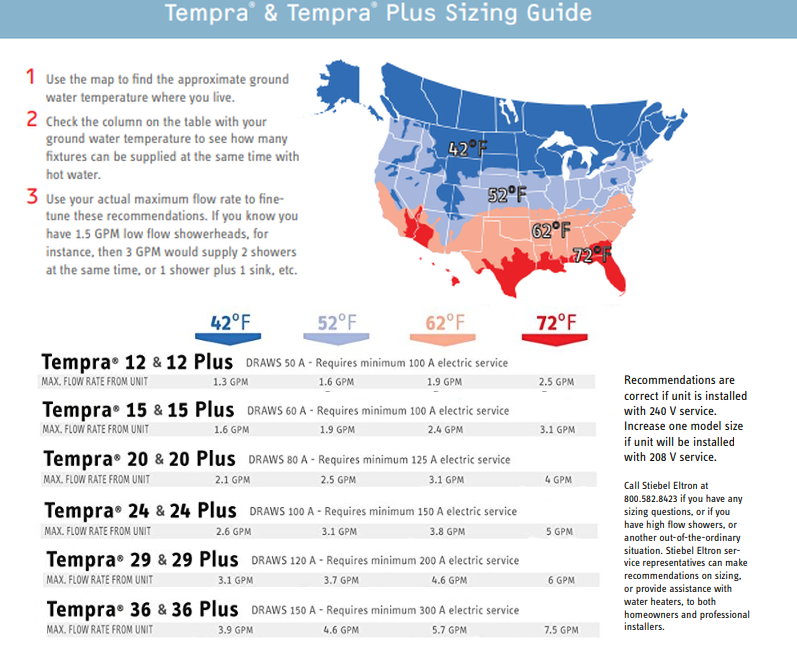 If the weather where you live is such that the inlet water temperature is about 42°F during the winter, you will need to select either Tempra 24, Tempra 29 or Tempra 36. All three models will provide you with the required flow rate during all year. Clearly, based on the above chart, the other 3 models will not provide the required 2.5 GPM flow rate when the incoming water temperature is 42°F.